Mariana Palomino, lives and work in the Canary Islands. She has a Degree in Fine Arts from the university of La Laguna. She was part of a group of 12 artists who joined alliances to bring colour and life to a 2000m2, 2km long wall around the port of Los Christianos, Canary Islands. They painted every day for an entire year. She has been part of an artist residency that helped her grow as an artist and now she has been to countries such as Italy, Spain, Brazil, Colombia and Mexico to share her artistry. For her participation in the International Public Art Festival, Mariana was fortunate to deliver two pieces both with equally strong messages concerning awareness to human behaviour and its effects. Her first mural was painted with the mind to educated youth at a grassroots level concerning the importance of protecting animals. 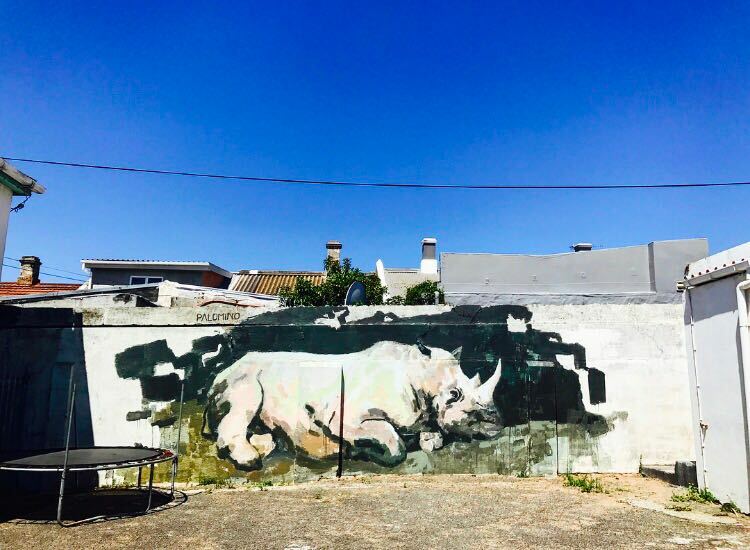 The mural was dedicated to “Rhino poaching” which is a huge problem facing South Africa and the world as a whole. The rhino horn is one of the most sought-after products in the global black market where its price exceeds even that of gold. It is said to believe that an average of three rhinos are killed by poachers every day. Illegal trade is the biggest threat to the different species of rhinos and some such as the northern white rhino, has only one living male remaining in the Ol Pejeta reserve in Kenya, guarded by park rangers 24 hours a day to protect it from poachers. 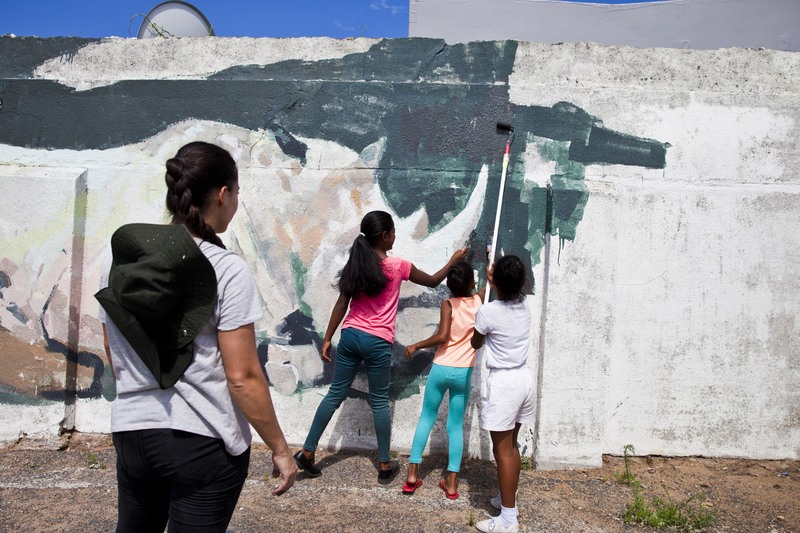 The “Save the Rhino” mural was painted with the help of local kids from a crèche in the community. Mariana believes that “change begins in education”. 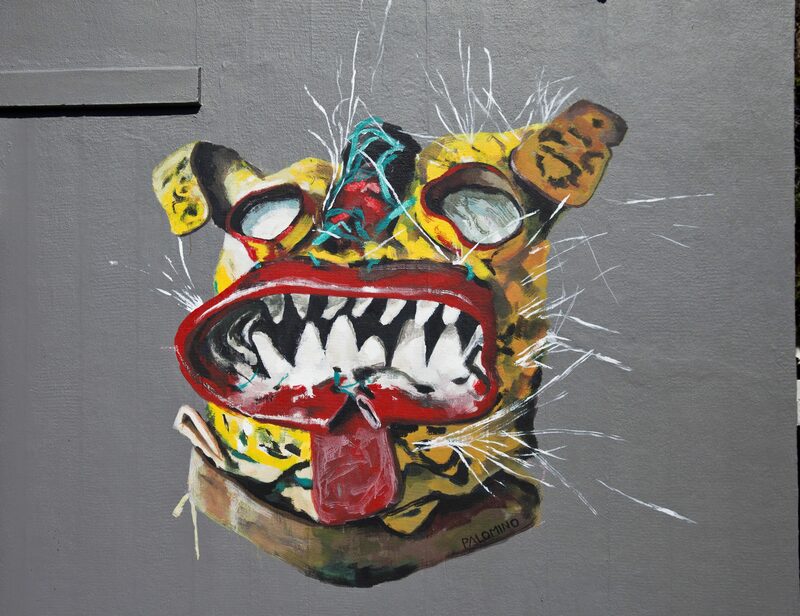 Her second contribution to the Public Art festival features a traditional Mexican mask from the state of Guerrero which is worn in a traditional dance to represent a petition for rain. Cape Town is currently experiencing a water crisis that has led to drastic cuts in the daily supply and it could become the first big city to run completely dry. The city is currently counting down to day zero when taps will no longer flow with what gives life. Mariana felt it was fitting to share something all the way from Mexico in solidarity to our current dire situation. Through her mural, our water crisis is made Global as not just a Capetonian issue but a question of the quality of life for all mankind. “The story of one is the story on many” and global citizens should all reflect on the way they value the source of life.